The latest incarnation of a long-running library introduces new instruments, articulations and enhancements. Back in 2004, Garritan Personal Orchestra provided a radical alternative to the massive symphonic sample libraries of the day by cramming every orchestral instrument under the sun into a supremely affordable package requiring a mere 2GB of disk space. This approach proved durable, spawning several updates which have now culminated in the release of GPO 5. As well as incorporating GPO 4’s samples, this major upgrade adds much-requested additional strings, new choir sections, expanded Project SAM brass, two new grand pianos and a host of fresh features, resulting in a greatly expanded sample database of 11.6GB (installed size). As with its predecessor, the library runs exclusively on the Aria sound engine, which works stand-alone and as a VST, Audio Unit, AAX and RTAS plug-in on operating systems from Windows 7 and Mac OS 10.8 onwards. Projects created with previous versions won’t load in GPO 5, so anyone wishing to revisit earlier work should keep their old versions installed. In this review we’ll concentrate on GPO 5’s new material. If you want to dig deeper, check out the SOS reviews of the original library and GPO 4 update, published in October 2004 and June 2010 respectively. The ‘better strings’ demanded by long-time GPO users have duly been delivered. Recorded at New York’s Lincoln Center, their large sections (12 first violins, 10 second violins, 10 violas, eight cellos and seven double basses) sound bigger, lusher and less synthetic than their antecedents. The violins play vibrato sustains, sumptuous detachés and seven types of short note, highlights of which are a sweet, lyrical portato style and a brisk, agile sul tasto bowing ideally suited to rhythmic ostinatos. Also included are harmonics, loose and tight col legno and pizzicato, Bartok ‘snap’ pizzicato, ricochets and effects such as atonal glissandi. The lower strings match the violins’ quality: I was impressed by the violas’ singing, transparent upper range and the rich, vibrant timbre of the cellos, and enjoyed using the library’s auto-legato and portamento functions to perform Bollywood-style string slides. 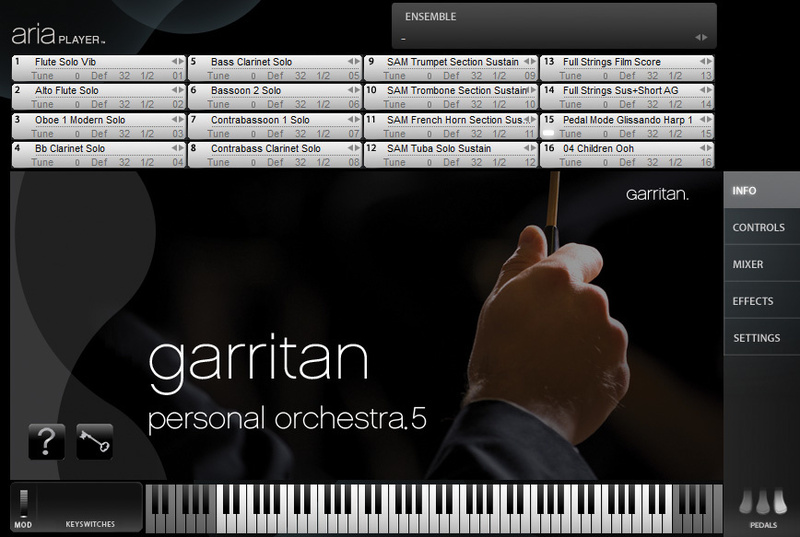 These sections actually first came to light in Garritan Orchestral Strings, described in SOS’s May 2002 edition as “the most ambitious sampled string library ever undertaken”. That mega-opus was a true labour of love and it’s good to hear its instruments, now benefiting from loops, keyswitches, improved processing and full-range presentation, back in action again. Other new additions are freshly-squeezed solo strings and small sections of three violins, four violas, three cellos and two basses, all playing a selection of basic styles. The three violins’ vibrato is a touch overstated for my taste, and some may regret the absence of non-vibrato string performances. Nevertheless, these are strong, well-played samples which, in tandem with the GPO 4 string patches incorporated in the update, offer a wealth of musical options. Moving on, if you’re in the habit of creating harp glissandi by swooshing your hand up and down the keyboard white notes, you can now pre-determine the glissandi scale with a set of seven virtual pedals (just like on a real harp), rather than having to painstakingly edit each pitch after the event. Great idea. Though beautifully in tune, GPO 4’s mixed-voice choir was very limited in scope. Choral enthusiasts will welcome GPO 5’s separate sopranos, altos, tenors, basses, boys and childrens’ choir sections. Keyswitchable ‘oohs’ and ‘aahs’ are sung by all, with the youngsters also contributing ‘eehs’. A nice bonus is a mellifluous solo soprano whose lovely vocal timbre is mercifully unsullied by over-the-top operatic vibrato. All in all, these are very usable samples which benefit from a splash of reverb. A significant development in the keyboard department is the arrival of a new Steinway D grand piano. Blessed with a fine, noble and open tone and a convincing dynamic response, this top-of-the-range nine-foot instrument is a pleasure to play, and its soft-toned ‘Intimate’ patch works well for quiet ballads. Also included is a new, seven-foot Steinway Model B with a pleasantly bright and assertive timbre. The Project SAM brass patches supplied in GPO 4 have now been expanded with marcato and staccato articulations for French horn, trumpet, trombone (sections and solo instruments), piccolo trumpet and bass trombone. There’s also a cool new pipe organ screen on which you can select and mix up to 12 of GPO 5’s 24 organ stops. In other news, GPO 5’s ‘Sonic Morphing’ technique expands the dynamic range and smooths out transitions between layers. The on-board reverb gets 16 new impulse response presets, and a much-improved browser makes ‘shaky-hand syndrome’ a thing of the past. New users may need time to adjust to GPO’s idiosyncratic sustain pedal behaviour — in most instruments the pedal is used to temporarily activate a note-smoothing legato mode, rather than doing its normal job of sustaining notes. 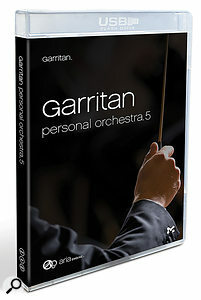 In my view, Garritan Personal Orchestra has always been a great resource. Its complete instrumentation and super-fast loading are a boon for mock-ups, and though it can’t rival today’s big orchestral collections for sonic depth, some of its instruments are superb. GPO 5 builds on the legacy: it’s a versatile, musically solid collection with something to offer both budding orchestrators and experienced professionals, and, as ever, it’s very reasonably priced. Other affordable orchestral packages include (in descending size order) Vienna Symphonic Library’s Special Edition Vol 1 (27GB), EastWest/Quantum Leap Symphonic Orchestra Play Edition (Silver version, 11GB), Miroslav Philharmonik 2 Classik Edition (10GB) and the MOTU Symphonic Instrument (8GB). Each of these libraries ships with its own player software, but none matches GPO’s comprehensive instrumentation. The comprehensive instrumentation includes exotica such as bass flute. An ideal tool for mock-ups and which also has great educational value for newbie orchestrators. Posh strings and expanded choir are welcome additions. The sustain pedal behaviour may cause some frustration. 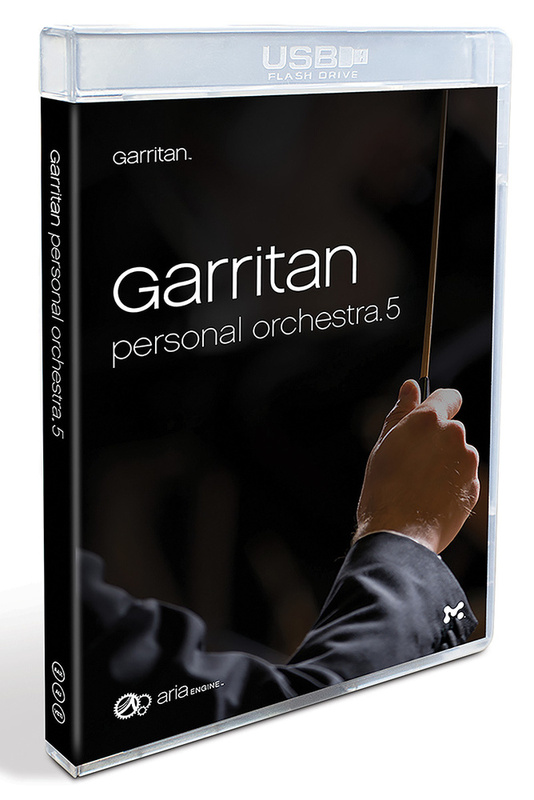 GPO 5 builds on the long-standing Garritan Personal Orchestra legacy, greatly expanding the sample database with new instruments and additional choir sections. Though its sound is less luxurious than contemporary large-scale symphonic collections, it remains an invaluable, easy-to-use tool which provides all the instruments required for orchestral arrangements while retaining its traditional affordability. £129, upgrade from GPO 4 £44.95. Prices include VAT.